Discover this incredible 2-mile long tunnel at Snoqualmie Pass – a remnant of our railroad history! The biking trip will take you through the tunnel and then along a 20-mile stretch of the Palouse to Cascades State Park Trail (formerly known as the John Wayne Pioneer Trail), complete with sweeping views of the Cascades and a lunch back at Rattlesnake Lake. Registration will open April 23. The registration fee helps cover cost of the shuttle, t-shirt, route map, snacks, and lunch. We’ll meet at Rattlesnake Lake in the morning and catch a shuttle with our bikes up to Snoqualmie Pass. 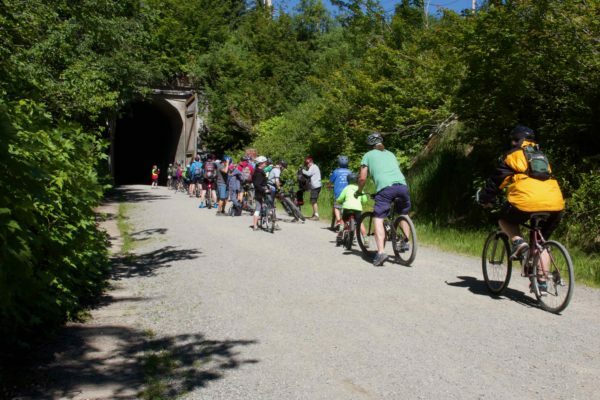 After biking through the historic 2-mile long tunnel, we’ll spend the next few hours biking along the Palouse to Cascade State Park Trail back to Rattlesnake Lake, ending with a post-ride lunch to celebrate your trip! Age Restrictions: 12 years old and up (see exemptions). All youth 16 or younger need to be accompanied by an adult. Be able to bike at least 20 miles on a gravel trail. While the grade is gentle (it’s an old railroad line) it does have moderate difficulty because of the longer distance and the occasional sections of looser gravel. Estimated pace for bicycling will be 7 mph, meaning participants should anticipate biking for 3-4 hours (maybe a little more, once you add in the stops along the way). A mountain bike and helmet. Since the trail is packed gravel with occasional loose sections we recommend all riders use a mountain bike because of the wider tires and increased stability. Experienced riders who are comfortable biking in these conditions may use a hybrid bike. Road bikes (with their thin tires) are not allowed for safety reasons–it’s too easy to fall. Need to rent a bike? Compass Outdoor Adventures is offering our participants a discounted mountain bike rental of $50 for this trip and will bring them to the start location for you. Email us for details. Strong headlamp and/or bike light. The tunnel is unlit and will be completely dark! Discover Pass. We’ll be parking at Iron Horse State Park, so you’ll need to have a Discover Pass for your vehicle. Once you are registered and paid, we will send you more detailed information about the trip. You can also check out our Frequently Asked Questions. Check out photos from last year’s trip. Greenway volunteers plant trees, build trails, remove invasive species, and more! Families, individuals, schools, and corporate groups welcome.